I'm thrilled to be working on a childhood dream thanks to IDW Publishing. The Turtles are what got me excited about comics when I was 10 or 11. It also was my first foray into pen-and-paper role playing. 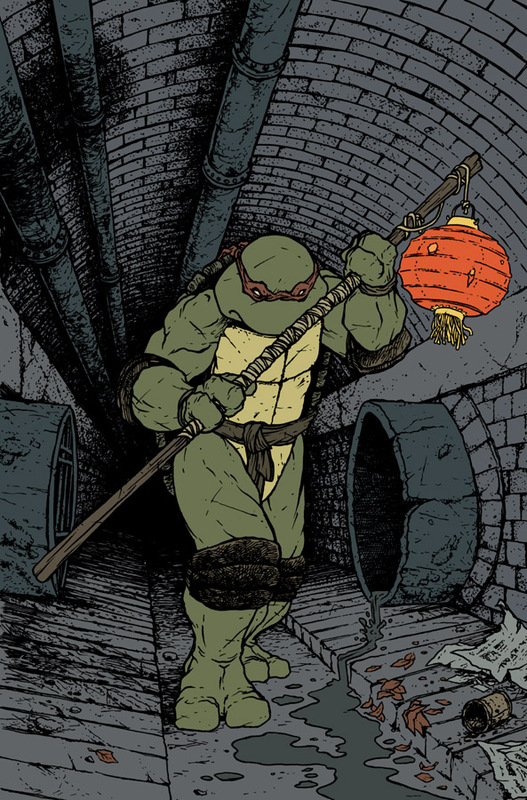 For the IDW line of TMNT 1 issue micro series, I have been doing the covers, one cover per turtle. 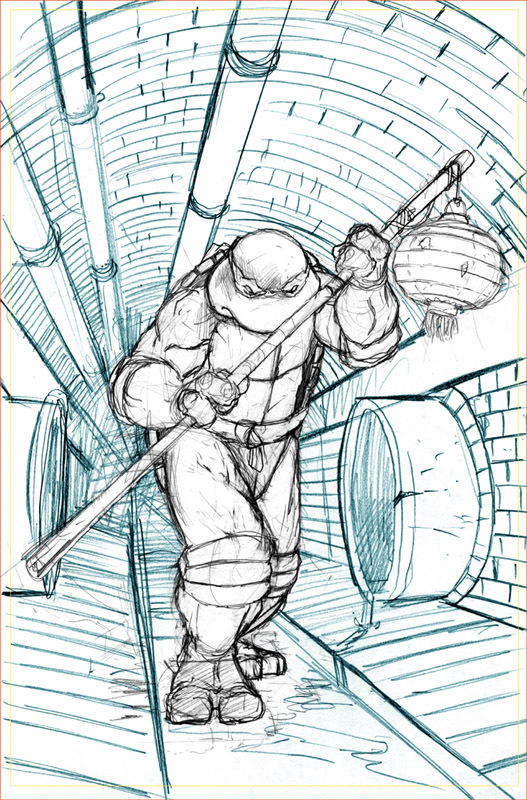 Here are my past posts about the process for Raphael & Michelangelo, but this post is about Donatello. 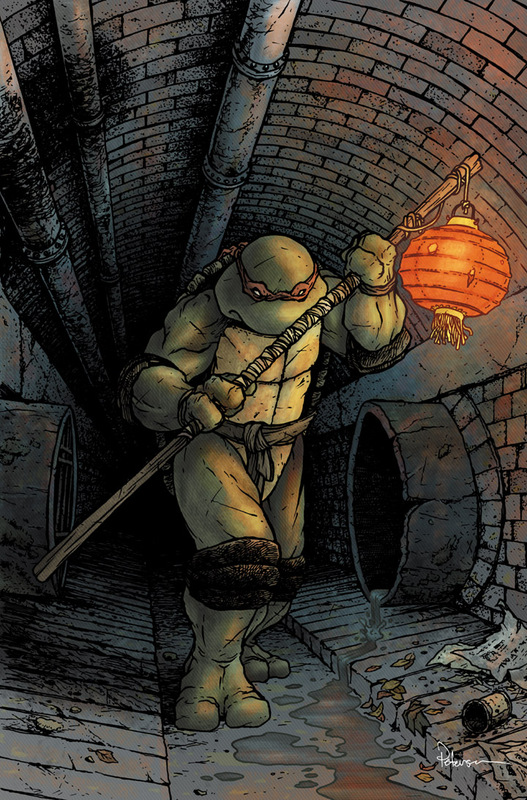 Covers are storytelling and like the Raph & Mike covers conveying something about the personality of each Turtle, I wanted this cover to talk about the personality I saw Don having. 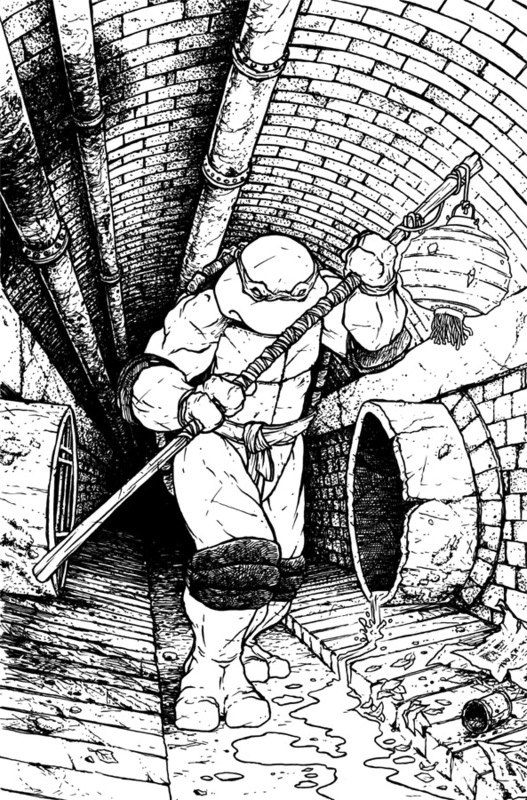 I decided to place Don in the sewer. It's where the Turtles call home, but I also felt that I could convey a bit of a loney-loner vibe that I see Don having. While I avoid the idea that the cartoons pushed of him being a computer programming rocket scientist, I think of Don as having more of a Mythbuster/practical physics mind..and I'm sure that would separate him from his brothers in terms of relate-able subject matter to discuss. Don is also the favorite turtle of Jesse Glenn (basis for my character Kenzie). Turtles are what brought Jesse & I together as friends, and I thought it would be fun to give Don a Kenzie-esque lantern-staff...but of course using NYC salvaged materials. After searching for good sewer photos, I wasn't able to come up with something I liked, so I just drew a sewer with a vaulted ceiling. 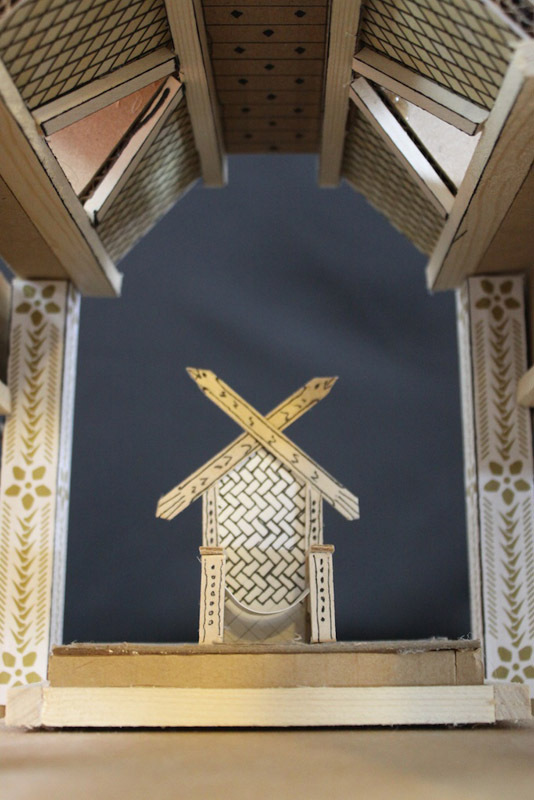 I was worried about all the perspective for the concentric circles the arched roof was made of. I was also worried about getting the spacing of the bricks right. 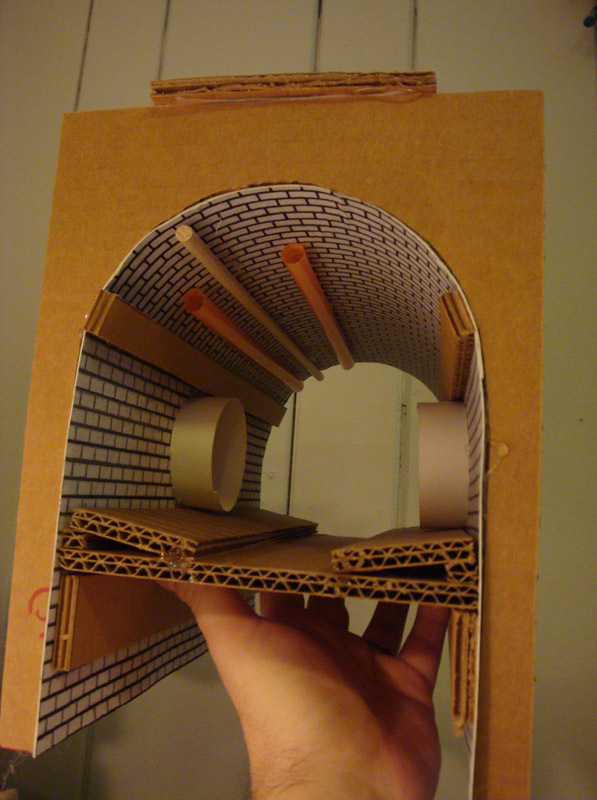 So I quickly mocked up a sewer model to match my sketch using printed out sheets of a brick pattern conformed to the shape of the arched cardboard. I added a few dowels and straws to simulate steam and or electrical pipes that can run along the roof of sewers and drain pipes. I printed my rough drawing above with a photo of the model substituted for my rough background drawing. I inked the piece on my lightbox using my rough & photo as a guide for the ink lines. Like usual, when inking I'm concerned with texture and line quality...how different patterns of line can suggest different textures or surfaces. For pens I'm now using Copic Multiliners, the same pens I'm using on Mouse Guard. I did a little bit to suggest the lighting with the ink (the cast shadow & the darker recesses of the sewer stippling into lighter foreground) but I wanted to save most of the lighting effects for the coloring. The next step is to scan the inks and start 'flatting' which is the starting stage of coloring. Here I'm establishing areas of color..making the area that is Don's front shell different than the colors that are his arm or head or the sewer. Some color choices are made in this stage, but they could be all wrong on purpose if I wanted. The goal is to make sure that the different parts are all separated by a different color. Here I was pretty close and only made a few adjustments after I got into the rendering. I have to admit, even though I know the process, the flatness of these flats left me worried. I had envisioned a very atmospheric cover with a lot of depth and the flat colors showed that I had a long way to go to get there. The last step was to render the piece. This means adding in all the shading and lighting effects and color holds and highlights. I was right when I thought it was going to be a long process from the flats to this point. There was a few hours of just tweaking the lighting and shadows until it was the right amount of contrast and glow. Before I knew Archaia's plan to do a 6" x 9" book, I started work on a FCBD cover the way I normally would...as an 8" x 8" square flip book like the last two years. 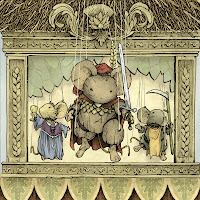 The morality tale in my story is all being told through a puppet show, so the cover features the three main cast of the play with the puppet theater where the show is staged. There was barely room to accommodate the traditionally blank space where retailers can stamp or label their store's info so new customers will know where to return. Then I got the call about the size format. 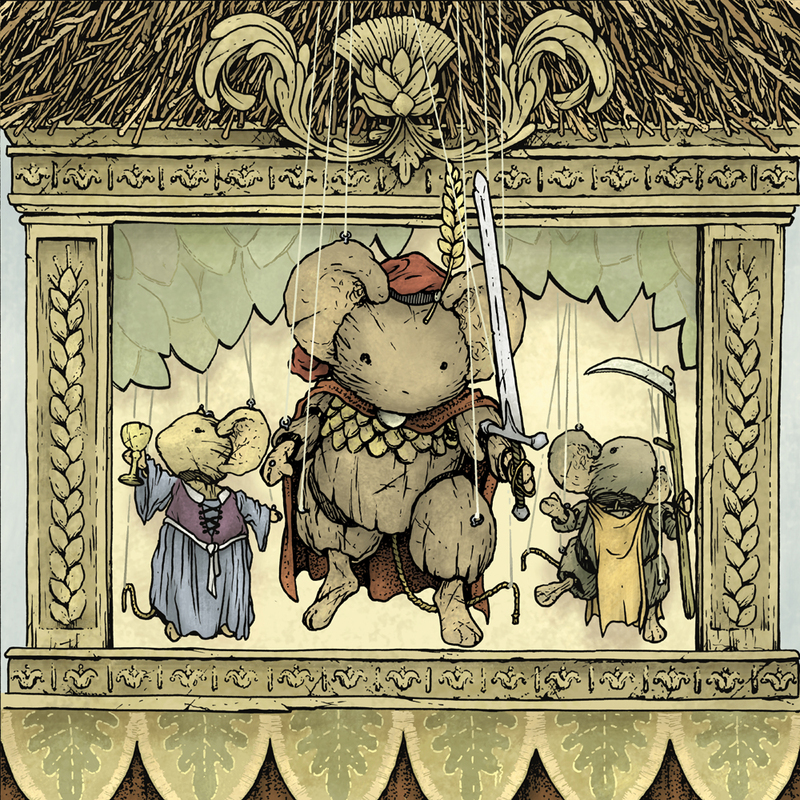 I still plan to do my pages square, floating them on the 6" x 9" page with decorative elements framing the panels (so that later I can collect the FCBD stories sometime down the line in a Mouse Guard 8" x 8" format), but for the cover...that needed to be special. 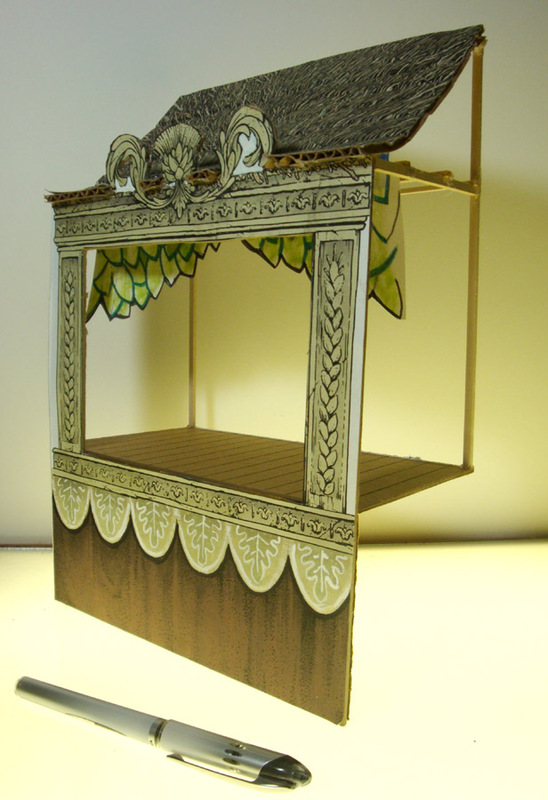 Once I started working on the story, I wanted to build myself (you guessed it) a little model of the puppet stage. I did this because 1) I had already designed the look of it when I drew the cover, so it would only mean printing out my cover at and pasting it to a few sheets of cardboard, and 2) since I was going to be blocking out a tiny theatrical play, I wanted to make sure I had an understanding of how deep the stage was, how the backdrops could be unfurled for a new scene, what room the puppeteers had etc. The model is made of cardboard a few balsa sticks and my printed out drawings from the cover art. 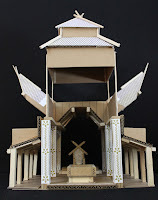 It has one of the highest quick/quality ratios of all the models I've built. 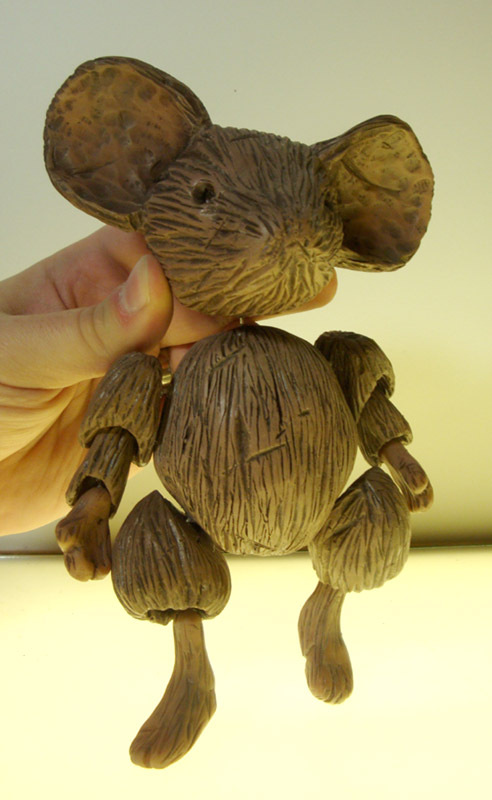 And earlier in the year, after drawing a Mouse puppet builder, I had a bug to make my own mouse marionette. I sculpted the shapes out of Sculpy, building up the mass of the head and body with balls of tinfoil. Once the polymer clay had baked in the oven and cured, I carved the enlarged woodgrain (and various dings, dents, & scratches) with my woodcarving tools. The marionette has come in very handy for me to reference...not just for proportion, scale, and the anatomy of the joints, but for feeling the weight of how the arms WANT to hang, the head WANTS to loll to the side, the legs WANT to dangle. That brings us to a teaser. 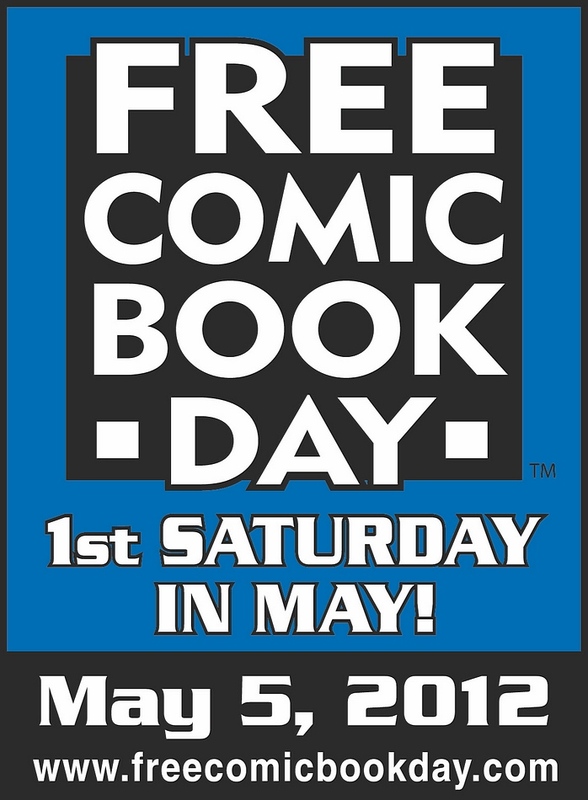 Here is the first page of my Free Comic Book Day Story colored sans-text. I know it's a long wait till May 5th of next year for the rest of it, but now is the time to tell your comic shop that you want this hardcover! I was lucky enough to be asked by the folks at Archaia to do a pinup for their Jim Henson's The Storyteller Anthology Graphic Novel. (This also marks the 3rd Henson property I have been fortunate enough to have done pinup/cover/promotional artwork for Archaia!) 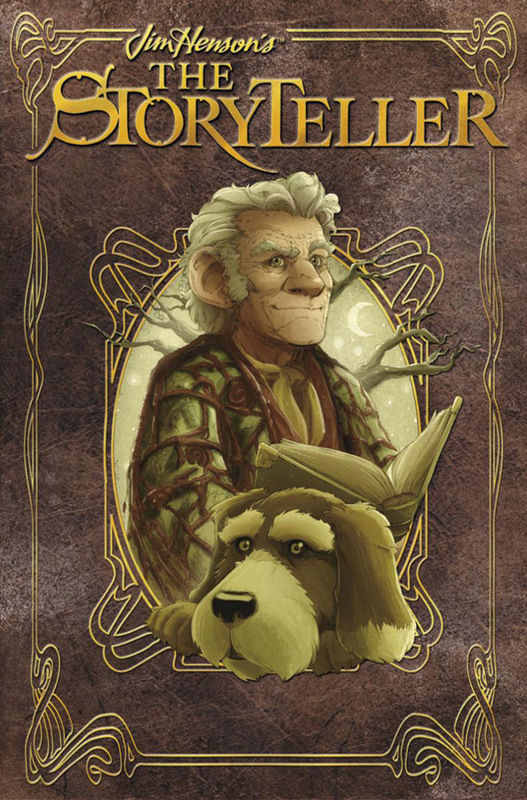 The show did a wonderful job of transitioning between the Storyteller character and his dog and the story he was telling. The characters from the tale would appear in the reflections of water in bowls, on the sides of decorative steins, and in the painting over the hearth. I focused much of my attention to a way I thought I could capture that transition idea in a single pinup. The story I started with was called The Tinderbox by Hans Christian Andersen. 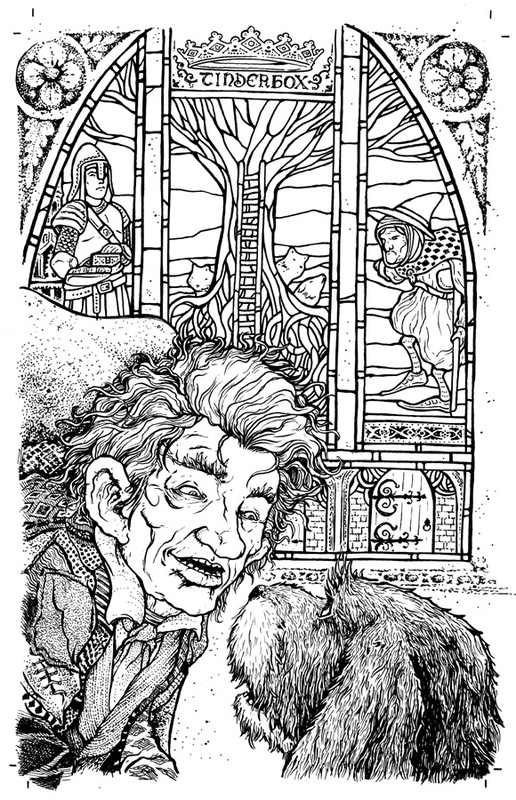 The story starts with a soldier who, on the request of a old witch-like woman, climbs down the trunk of a hollow tree to a cavern where three giant dogs guarding piles of treasure dwelled, as well as a magic tinderbox capable of controlling the beasts. 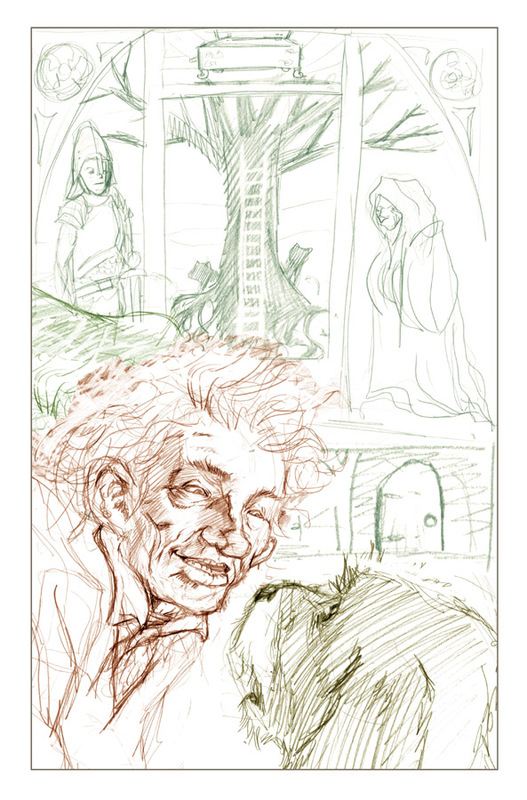 I only roughed-in these parts in my sketch and focused more on trying to get the linkess of John Hurt as the Storyteller and his Henson-furred dog. I scanned the sketches from my sketchbook and resized the elements (adjusting how close the Storyteller and his dog are sitting, where they sit in the frame, etc.) 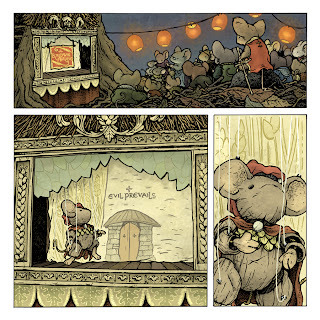 I also tinted the pencil work different colors to help me visualize what lines belong to which character or the window. I printed that layout at full scale and used it as a template to ink the piece, I started with the characters choosing to focus on the stained glass last. With the inks I tried to translate the softer pencil lines as competent inks lines. While areas like the Storyteller's jacket, hair and his dog all benefited from the ink translation, I lost something in his face. I planned to put some of the volume back in at the coloring stage. I'm sorry to say that paper I did my tighter version of the stained glass on has vanished. I know I was layering paper over the top of the rough and tightening in pencil and then with another overlayed sheet of paper stylizing the lines into stained glass lead-lines. For the coloring, I scanned the inkwork in as usual and then colored it in photoshop 7 (yes, I know it's old..it's pre-CS...but it works and I LIKE IT!). I tired to go a bit more painterly on the Storyteller's face than I do with my normal Mouse Guard coloring. 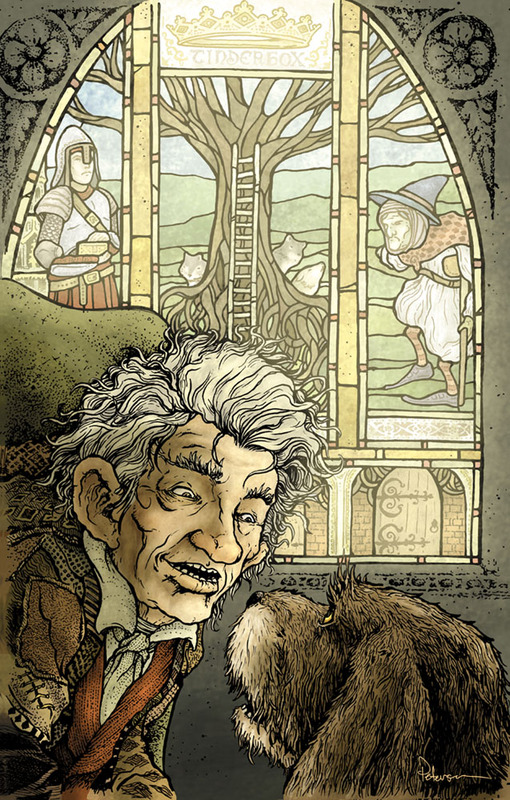 Part of that was that the splotchy texture works on everything -Mouse-Guard-ish but not as much with people's skin tones.Lots of color holds (areas where I color my black inkwork instead of leaving it black) were applied to the stained glass window including an overall glow for the window. I had fun with this piece. I struggle to draw people since I'm out of practice and never had a great hold on it even when I was taking figure drawing, but I do find that drawing craggy-faced old men comes very naturally to me. Now that Black Axe #3 is out, I can share some of my model-madness. 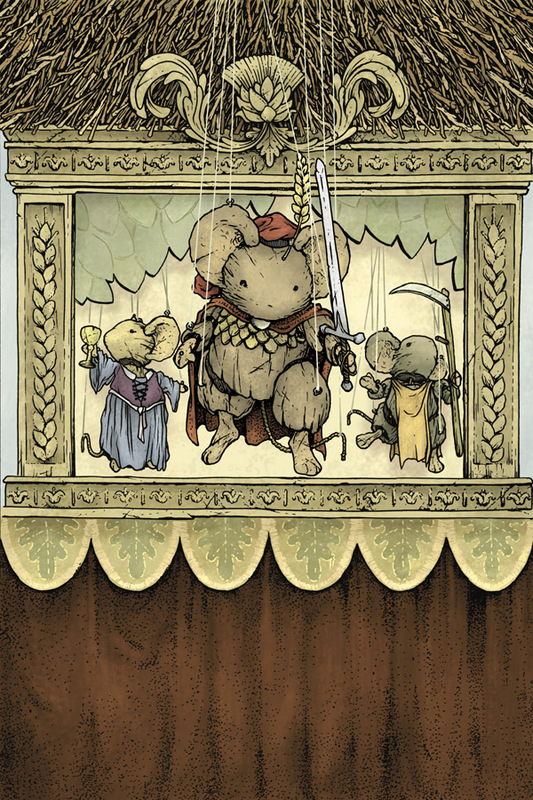 This issue has the mice inside a Ferret hall on the un-mapped island of Ildur. For the aestetic I wanted something Norse. 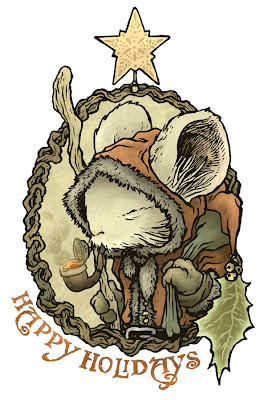 Back when designing Darkheather for the Winter series, I had planned on using that influence as well. 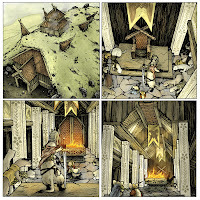 I found it difficult to imagine the underground Darkheather with the Norse visuals of the rooflines and carved beams. I found a book on Moorish architecture and abandoned my Norse ideas...until it was time to show the Ferret hall. I kept the idea that much of it would still be subterranean and underground, but the main hall could have exposed gates, shingled areas, and retaining walls. 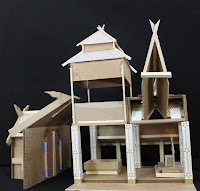 The model is built from my normal materials: chipboard (the backs of discarded sketchbooks and bristol pads) paper, cardboard, and some balsa wood scraps. 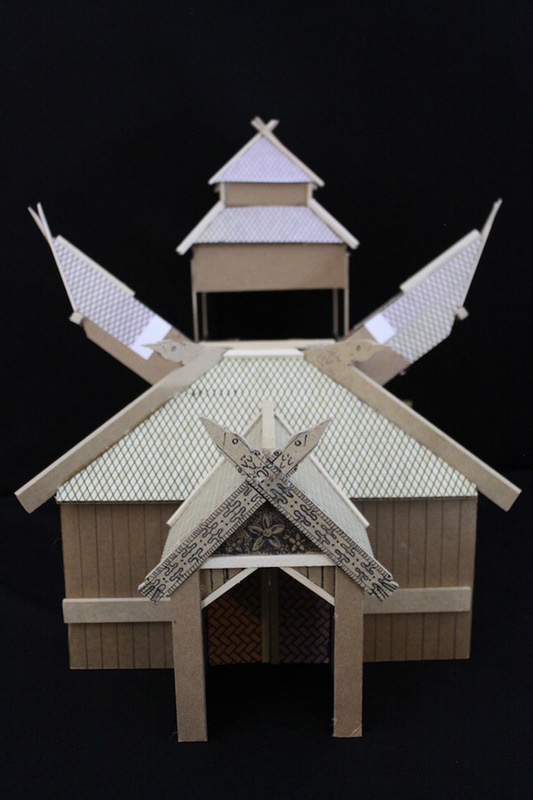 Using rubber cement, I was able to apply printed designs to the columns and shingled roof areas. The rest of the model is held together with hot melt glue (which I've started using over other adhesives because it doesn't dry out over time and lose its bond). I know it seems obsessive to build something this scale for an issue's background, but I feel the issue goes quicker because of this prep work. I've explained in the past that model making helps me focus on design in a way drawing doesn't. Something about holding some wood up to a scrap of cardboard to estimate what scale the columns will be to the door, or how tall the ceiling will be seems a more intuitive way for me to imagine a space than to draw and erase architectural elevations for days. 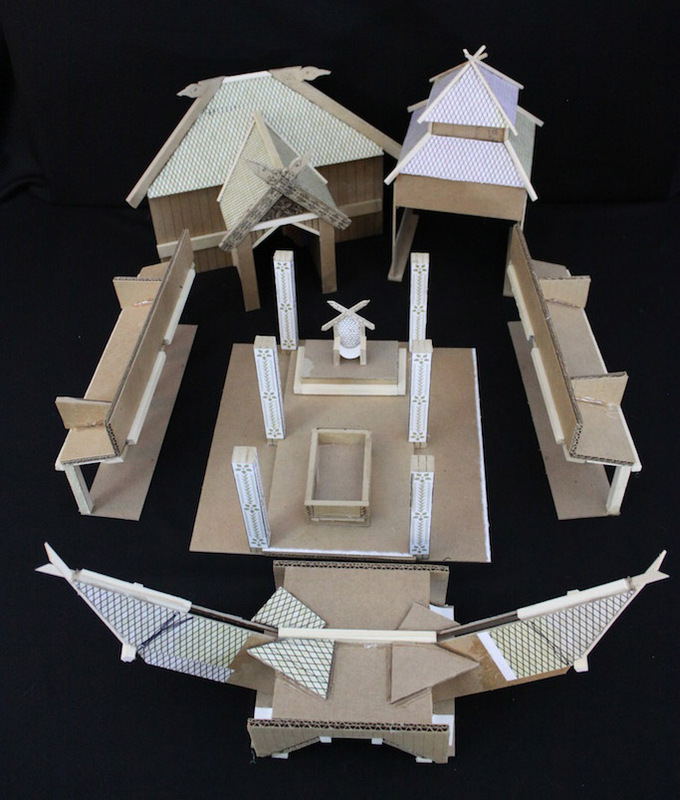 Like other models of mine, this one is modular, meaning it both comes apart and sections can be reused in other configurations. 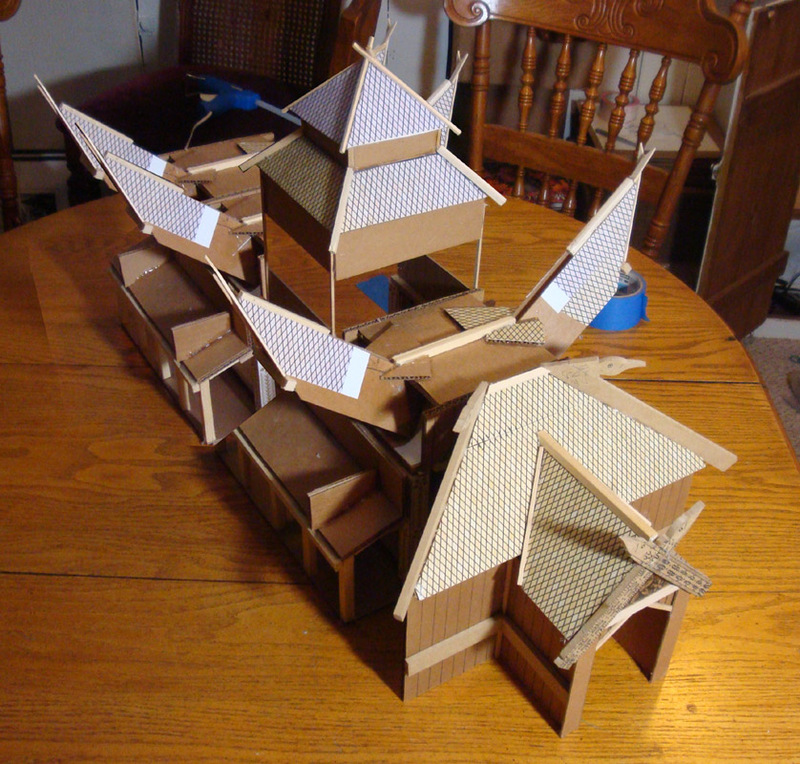 The 'real' Ferret hall would be two lengths of my model. 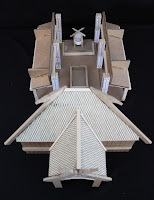 but by making sure that details like the fire pit, the chimney-cupola, the skylights, the gates, and the throne were not connected to the main hall model, I could set up the model to represent either end of the hall. 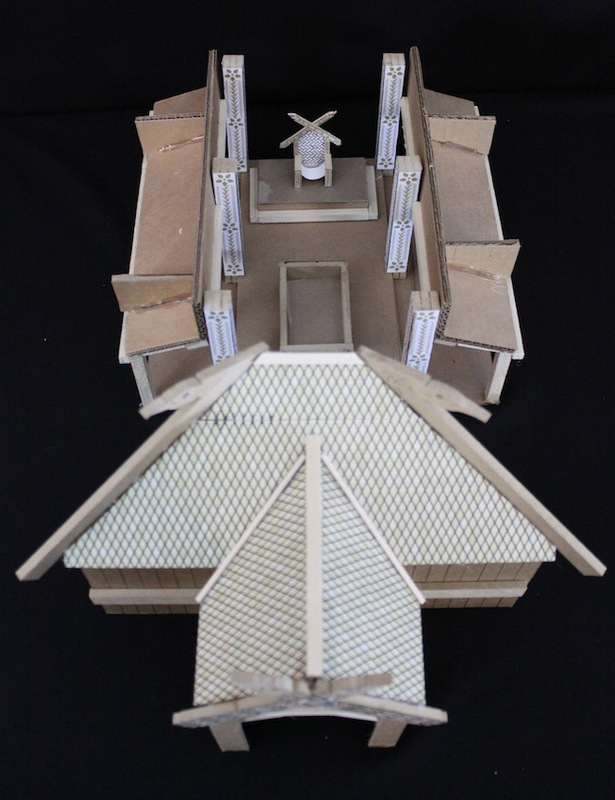 The 'wings' can come off as well, but that was so I could view the model from the side without having to view it through the restricte lower roof line there and tighter columns.